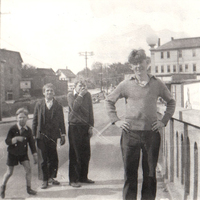 l to r: George Lawton, Herbert Lawton, Jack Veitch. 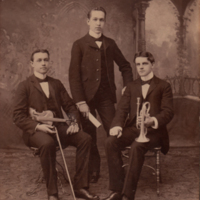 The orchestra or sometimes referred as the LVL Trio was organized around 1900 and was under the direction of George Lawton. Herbert Lawton was a pianist. 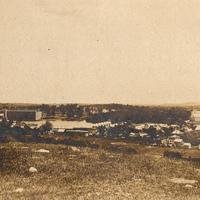 Photograph of Maynard and Mill Complex taken from Summer Hill. Note dual smokestacks on the mill and the Main Street School on the right. 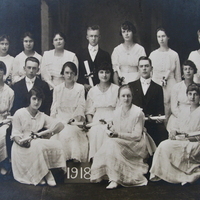 Front: last on right is Marion Gladys Townsend, the daughter of Benjamin and Louise Carter Townsend. 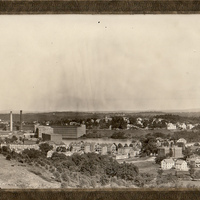 Photograph of Maynard, the mill complex, and St. Bridget's Church taken from Summer Hill in 1905. A photo of the Walnut Street Bridge in 1932. 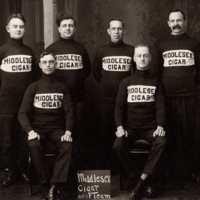 Several Maynard citizens are posing: (r-l) Richard Sherman, Victor Kizik, Johnny ___, Roy Dean, and (unidentified).